And what is the difference between a described archaeological interpretation and the same one simulated on screen? The decisions that are made about what to include in museum displays by curators are similar to those made by game designers. An exhibit is designed as an experience for the visitor to find out information. In a museum, visuals, text and sound are used to convey information about the past in a way that is meaningful to a visitor with no prior knowledge. Artists’ renderings of the past are examples of passive media which the visitor takes no part in. One is unable to “explore” these media forms. Instead the visitor must remain watching to take in all the information. In contrast hands-on displays such as replicas provide a tactile form of the experience that engages people of all ages. History has been dealt with in various ways in video games; many video games draw on historic symbolism to create spaces where the user explores a reified form of the past placed in the modern form of video games. Games like Rome Total War, Rise of Nations and Sid Meier’s Civilisation V all rely on historical settings as part of their immersion rather than singular narratives of historical events or people, these Real time Strategy games use the past as content rather than a focus. One of the key discerning elements of virtual experiences is the ability to interact with the player and guide them on several levels, for example in the reaction to the environment, use of mechanics and use of narrative. The most effective games combine these elements in a coherent fashion and allow the player to progress and develop through the game, giving the player tools, information and challenges; there is a realisation that the game world is created for purpose. This inherent quality leads people to question deeply the design choices made by the developer in what they are trying to create; notable names of Youtube critics are James Rolf (The Angry Video Game Nerd), Jon Jafari (JonTron), The Machinima Channel and Yogscast. In this way the game designer can incorporate ideas unfamiliar in film and pictures; ‘breaking the fourth wall’ has been used to great effect in games like Metal Gear Solid, Assassin’s Creed II and Eternal Darkness: Sanity’s Requiem, where the player is reminded that they are playing a game. Parallels can be drawn to Brecht’s Epic style of theatre where the audience is deliberately ‘alienated’ from the emotional experience of the play and forced into viewing the play not as a story but as a production that is created, with underlying themes. The beginning of the archaeological game would begin “in the past” as it were, the player exploring a landscape and settlements as a character as if they belong to that time period, based on data collected and interpreted by archaeologists. This would be, to most people, the ‘real’ past, one that conforms to our own ideas about the past using some data to fill in the gaps. If the game solely focused on this representation of the past, it would fall victim to other issues of representation in a lack of self-awareness through interpretation; in other words, a game about the past that doesn’t actively acknowledge its own interpretation or representation isn’t an archaeological game. However, if a user inherently understands the game as an illusion, surely a plain representation as is should be enough? As with some of the examples above, the tools of the video game designer can be used to break the fourth wall and occasionally engage directly with the player. Instead of displaying everything correctly, we could occasionally take things out of the game world or show events as one of many possibilities; an example is the Assassin’s Creed Series. Assassin’s Creed takes place inside a virtual history generated by memories of ancestors. This works very well in the sense that the game world’s limits are the limits of those memories and their recreation. In some areas, the recreated world has ‘graphical artefacts’ where the system has not generated a fully ‘real’ image of the memory. 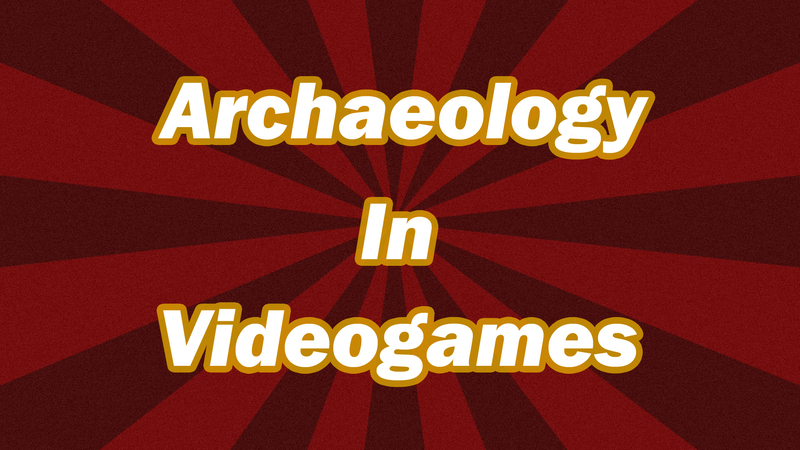 So how can new games be made to be archaeological? Part 2 to be released shortly. It makes feel proud that a blog that mix archaeology and anarchy quote one of my works. Long live for you all and DIY! You really helped put into words, some of the things I had wanted to say!